Everyone deserves a home for good. But with rough sleeping on the rise, more and more people are being left out in the cold. Government action can end rough sleeping, and almost has before. By 2010, 20 years of Government action meant the end of rough sleeping was in sight. But since then spiralling housing costs and cuts to homelessness services have seen it more than double. But it doesn't have to be this way. By taking action on social housing, private renting and funding for support services the Government can end rough sleeping permanently. 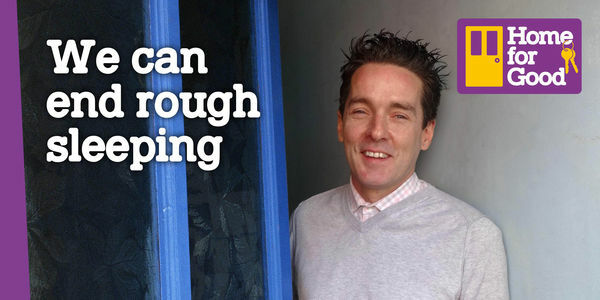 Kevin, a former St Mungo's client, knows first hand the issues that rough sleepers face. That's why he's written to the Secretary of State for Housing, asking for urgent action to put an end to rough sleeping. Support Kevin by signing his open letter today, and join us in the fight to make sure everybody has a #HomeforGood. You have the power to end rough sleeping. But it's not just about putting a roof over someone's head. People sleeping rough need a home for good – somewhere that offers safety, stability and the support they need to rebuild their lives. I've lived on the streets, in hostels, in a private rented flat and in social housing. And I've been helped along the way by mental health, substance use and homelessness services. These days I'm thriving – I run an inclusive community centre, and I've found a home in a housing association flat that's mine forever. But it wasn't easy getting here. In 2008 I got my first ever flat through a rent deposit scheme, after years of sleeping rough or in hostels. It was a private flat so suddenly all the support I'd had in my hostel stopped and I was left without a safety net. With nobody checking in on me, things quickly descended into chaos and I lost my home. It took five years for me to find my feet again. Now I work with people experiencing homelessness every day, and I see the same issues I faced come up again and again. It's hard being on this side of the fence, seeing people struggle and knowing that the money isn't there for the help they need. Not enough people are able to get a social tenancy like mine, and keeping a private tenancy can be so hard if you're not getting the support you need. Guaranteeing long-term funding for homelessness services. Right now I'm one of the lucky ones, but I know that with the right housing and support everyone can turn their lives around. Government action can end rough sleeping, but the new rough sleeping strategy doesn't go far enough. Please act now to get everybody into a home for good. Du kan til enhver tid administrere dine e-mailabonnementer. Har problemer med at underskrive dette? Giv os besked. Vores løfte: Velkommen til Care2, verdens største fællesskab i de gode sagers tjeneste. Her finder du 45 millioner ligesindede mennesker, der arbejder for at fremme udvikling, venlighed og varige virkninger. Care2 kæmper mod: fundamentalister, tyranner, videnskabsbenægtere, kvindehadere, våbenlobbyister, fremmedhaderer, forsætligt uvidende, dyremishandlere, folk der driver hydrofraktur, og andre onde mennesker. Hvis du deler overbevisninger med nogle af ovenstående grupper, opfordres du til at gå videre, dette er ikke et sted for dig. Care2 kæmper for: humanister, dyreelskere, feminister, demagoger, naturentusiaster, kreative, naturligt nysgerrige, og folk der bare elsker at gøre det rette. Det er den slags mennesker, vi er. Mennesker, der bekymrer sig om andre. We Care2.